Former dock-and-dine destination could become public nuisance if not torn down, port district argues. SAN DIEGO — What goes up must come down – only to make way for something else to go up again in its place. Such a cycle is playing out at the Port of San Diego as the Board of Commissioners approved a plan to demolish a once-popular seafood restaurant well in advance of the construction of a new group of eateries at the same location. 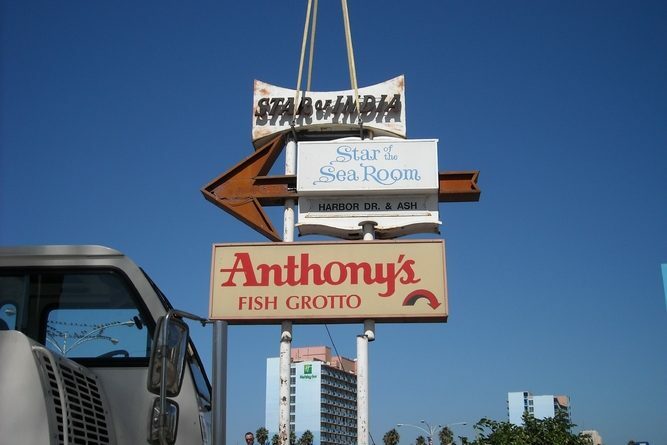 The port district specifically seeks to demolish the former Anthony’s Fish Grotto structure, which is currently vacant and fenced off, in order to avoid the development of a public nuisance on the San Diego waterfront. Demolishing the vacant building, port district staff stated, would be necessary regardless of planned redevelopment opportunities on the project site. “The [port] district has longer-term public safety and health concerns about leaving the vacated building ‘as-is’ including the potential creation of an attractive nuisance, possible trespassing and criminal activity at the site and the structure’s disrepair,” port district staff stated in a report to commissioners. Port officials are seeking the permit to demolish the former Anthony’s Fish Grotto site after The Brigantine, a local restaurant group selected to build a new set of restaurants on the waterfront site, apparently decided against going forward with its own demolition plans. A port district application means The Brigantine agreed to rescind its permit request for demolition. It is unclear what the district’s pursuit of its own demolition permit – and The Brigantine’s permit application withdrawal – means for the planned Portside Pier project, which aimed to bring new restaurants and an expanded dock-and-dine facility to the now vacant waterfront property at 1360 North Harbor Drive. Plans for Portside Pier gained traction with commissioners in December 2016. However the California Coastal Commission expressed concerns about The Brigantine’s project shortly thereafter and requested changes to be made to the submitted Coastal Development Permit (CDP). “As it would with any stakeholder, [port] district staff has been working collaboratively with [Coastal Commission] staff to clarify the Portside Pier Project and add additional conditions to the 2016 CDP through an amendment,” port district staff stated. Demolishing the Anthony’s Fish Grotto structure could cost the port district as much as $1.7 million. Anthony’s had operated three restaurants and a coffee kiosk at its waterfront location for almost 53 years. The company’s lease with the port district expired Jan. 31, 2017; Anthony’s vacated its waterfront location about six weeks later. Some issues associated with the current structure include extensive corrosion of electrical conduits, failing pile encasements, presence of soft rot and poor condition of steel braces.